Artisan's Asylum's 30,000-odd square feet were largely uninhabited when we arrived early Wednesday afternoon. No shocker there, really -- the space's president and co-founder Gui Cavalcanti warned us in advance that it wouldn't begin filling up until later that evening, seeing as how a big portion of renters hold down nine-to-fives. They occupy desk jobs during daytime hours in order to support their after-work passions, stopping by the space in the evening hours to produce works that might some day rise above the category of hobby. The duo behind WobbleWorks are strange cases, however, not simply due to the moving rabbit and dog ears they donned during our interview -- their paying gigs hardly qualify them for the straight-laced, button-down world we've come to associate with the term "day job." In 2011, Max Bogue and Peter Dilworth founded the small toy company aiming to help fund their true passion: robotic dinosaurs. The WobbleWorks cube is one of the first that we spot after arriving at the Somerville, Mass.-based hackerspace. It's a bit of a mess, packed with papers and electronics and random toys and other knickknacks. At the center of the chaos is a baby protoceratops, standing lifelessly atop a plank of plywood. Or, more accurately, it's a protoceratops skull at the end of a skeleton comprised of a mass of wires and gears, a large bike chain wrapped around its right side and a big handle attached to the center of its back. It's one of the more impressive sights in a renovated paper factory filled with amazing distractions. Dilworth flips three switches on the robo-dino's neck, firing it up. 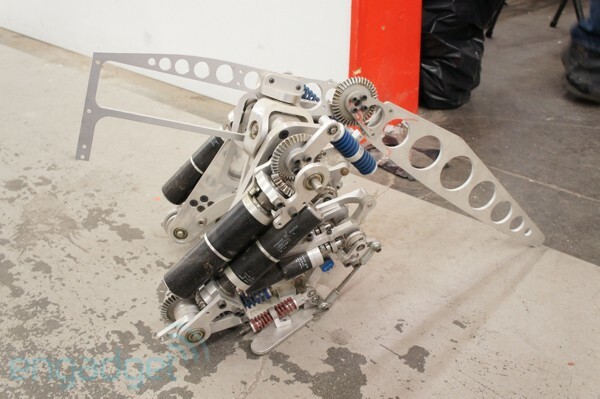 It looks around quizzically at first before its creator, manipulating knobs on a small block attached to the dinosaur with a thick wire, sends the robot on a clanking walk. The robot is roughly three or four years old, created as a museum piece, an attempt to bring life to lifeless exhibits made of fossil and bone. With a realistic silicone skin created by dinosaur exhibit giant Hall Train, the baby dino might someday become part of a robotic petting zone, wandering around the area with a certain level of autonomy, perpetually grazing in the museum hall. 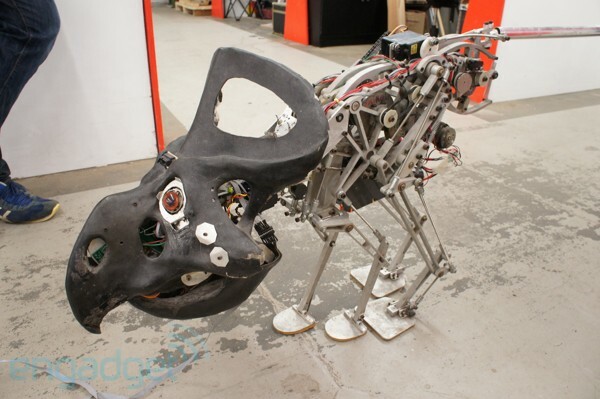 The baby terminator dino has its roots in the MIT Leg Laboratory, where Dilworth worked to help develop Trudy, a two-legged robot capable of balancing on a moving platform. His expertise in robotic dino locomotion helped him score a gig at WowWee -- that rare sort of work environment in which extensive knowledge of robo-dino skeletons is actually considered a marketable job skill. It's there that Dilsworh met Bogue, a veteran of the financial database world, who had secured a job at the toy robot company after a particularly fruitful conversation one year at E3. 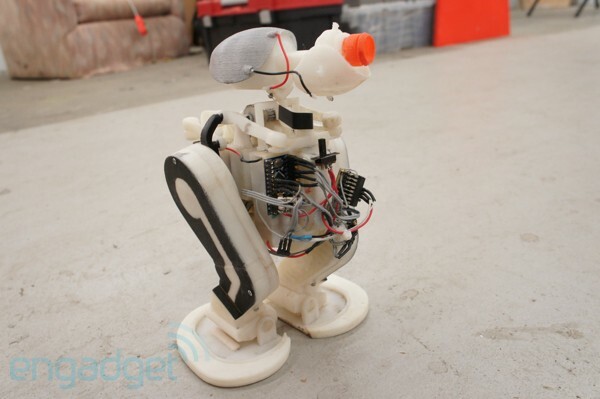 Bogue rattles off a long list of projects he'd had a hand in at WowWee -- a talking USB toy called Chatterbots, the Rovio webcam and Scotty, a home voice interface. Dilworth, naturally, brought his love of robot dinosaurs to the company, but the project ultimately proved unfruitful -- it was far too costly and overly complicated for the company, which had a much more streamlined product in the form of Roboraptor. His project on the outs, Dilworth spent his time working on the Uno, that self-balancing, two-wheel transforming motorcycle that managed to capture our hearts and minds two CESes ago. Bogue, for his part, found himself working on a telepresence robot for DARPA, among other products, after bowing out of WowWee for personal reasons. WobbleWorks was ultimately born out of several pub-based conversations, according to Brogue, before taking residence up at Artisan's Asylum. The cramped cube is certainly a humble world headquarters for a toy company with such grand ambitions, making up just one of 181 workstations in the massive hackerspace, alongside wood workers, bike modders and just about every other creative endeavor imaginable. The sense of innovative exchange that pulsates through the space feeds into their pursuits. Even in a warehouse so jam-packed with imagination, taking the baby dinosaur out for a spin is enough to stop traffic, fellow tenants peeking out over their cube walls in admiration of the minor electronic marvel. And while the tiny space in Somerville, Mass., serves as the world headquarters for the company, Dilworth and Bogue employ cohorts in Hong Kong and China as well. During our visit, the pair won't divulge too much about the projects they're prepping, even while many prototypes sit just behind them, atop of a couple of messy desks. They do happily show off a bipedal dinosaur, an early prototype of a future toy that they're looking to land in stores in the next year or so. It's not quite a museum-style protoceratops in every home, but perhaps the minimalist two-motor setup will make such products a little more widespread in a world that wasn't quite ready for Pleo. It's a small, off-white plastic contraption with two giant feet that lumber about. The company's also looking to branch out into four- and six-legged 'bots that share the two-legger's "natural gait," while maintaining a reasonable price point. In the meantime, WobbleWorks plans to keep the proverbial lights on with even lower-cost products -- like the Flap-itz moving ears, which the duo managed to model with a straight face during our conversation. 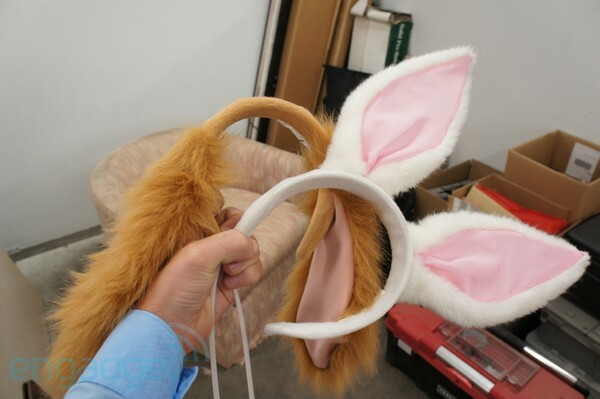 Unlike the fairly broad timeline for their two-legged project, the wearable ears actually have a rough street date, due out before Halloween rolls around. They're not quite giant robot dinosaurs, but hopefully their $10 price point will prove reasonable enough to help keep the company's daydreams of metal thunder lizards rolling along.